Some time ago I had a special wish for my birthday: I had asked my friends for a donation instead of presents. 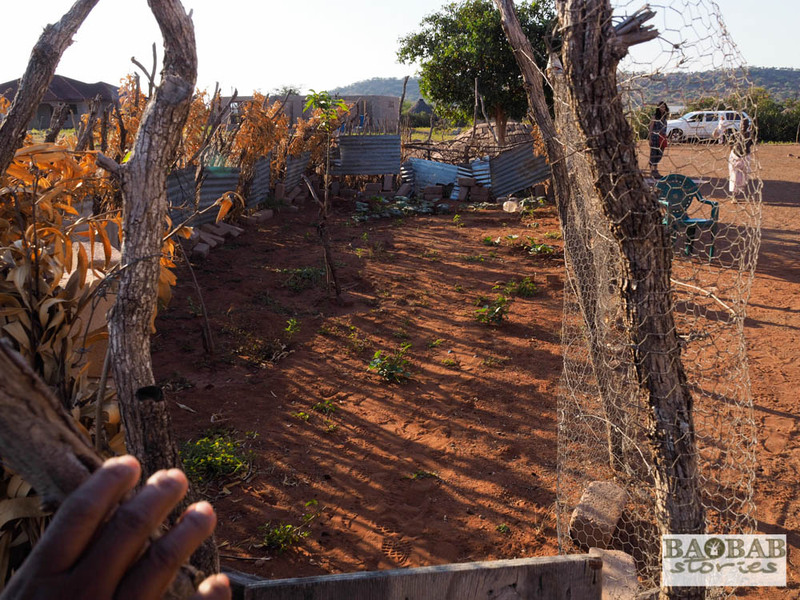 With the money I received I could fulfill a long-cherished wish: with the support of the Baobab Foundation in South Africa I could finance the planting of a little Baobab tree. Evelina Thsitete, one of the Baobab guardians, takes care of it. 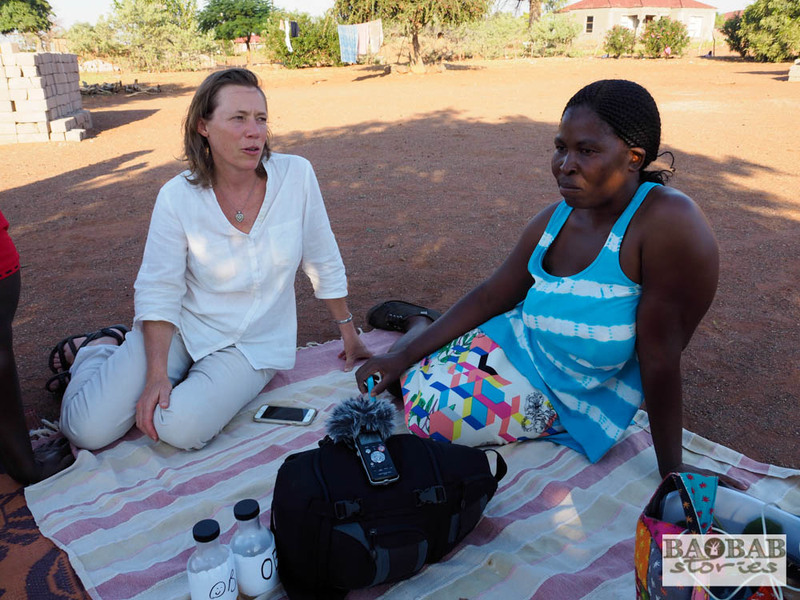 She participates in the foundation’s Baobab Guardians program and lives in Mukovha wa Bale, a small village in the Limpopo Province in South Africa. Today I pay her a visit and meet her for the first time. For this occasion, she has dressed up nicely and leads me straight to the little baobab. On our way I ask her about her life in this village and she shares some stories with me. She was born and raised in Mukovha wa Bale and has not completed any job training. This does not come as a surprise to me since the dual training system we are used to in Germany is not known in the area and good job opportunities are rare. 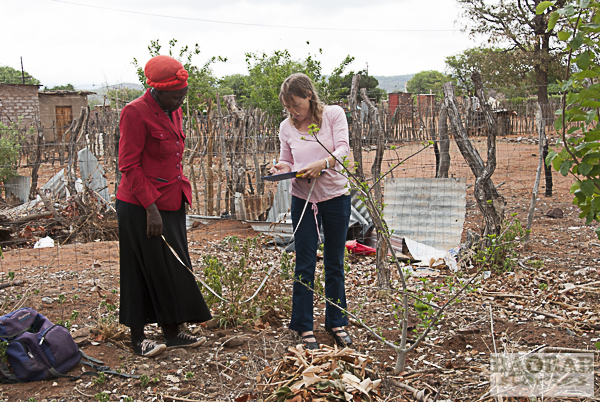 Evelina has married her husband early and moved to a village approximately 10 kilometers away. Over time, she has given birth to three children. When her husband died, she moved back to her home village where she lives in a house with a home garden. In it she planted the little baobab seedling. For the next three years she will take care of it to help it survive: “with the fence I make sure that it is safe from hungry goats, cattle and chickens,” she explains to me. It sits in the middle of a vegetable patch – the current neighbor is a pumpkin. I am unimpressed by its size but that will change one day. To gain in height as fast as possible is very important for the tree and it invests a lot of energy to grow a strong single stem and a big tap root. It does not have the storage capacity that large trees are famous for and therefore needs water regularly. Evelina will help with that. “As a Baobab guardian, it is one of my duties to water the little tree regularly”, she tells me. She gets an allowance from the foundation for planting the tree and taking care of it. We sit down on a mat on the ground in the shade in front of her house. Evelina is not only a baobab guardian – she is a baobab fruit collector as well. Every year when the fruit are ripe she collects them from the ground and sells her harvest to EcoProducts. “We used to carry the heavy sacks of fruit for miles on our heads to the collection point,” she recalls. Meanwhile, EcoProducts installed a collection point nearby. Evelina does not recall when she started collecting fruit “it has been so long and I cannot remember” she says and laughs. But she still recalls clearly how the sales of the frit helped her to get desperately needed income years ago. With the money she could buy milimeal (maize meal) for her family. She could even afford to buy construction materials. In 2006 she started building the house. 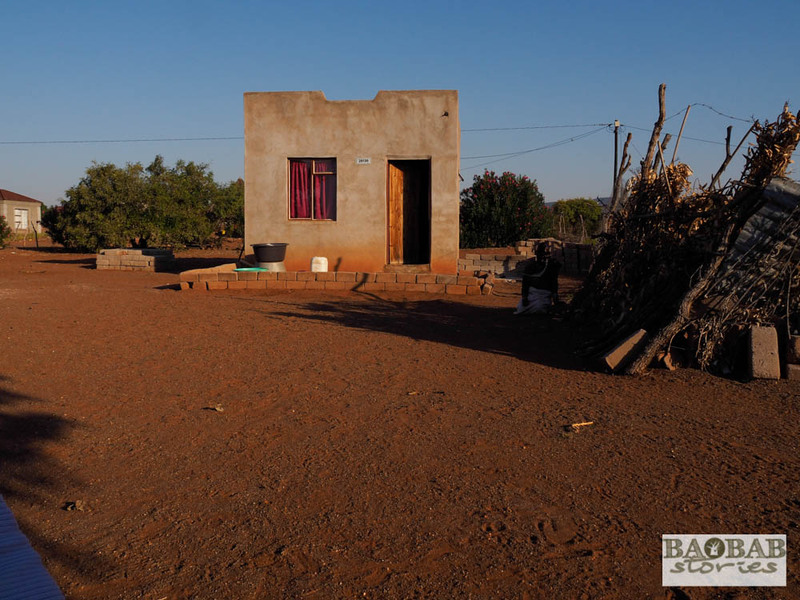 Her house looks neat and nicely plastered, the surroundings are clean and tidy. She is proud of her home – even though she currently has only this one room available. Here she lives with one of her children. The other two live with their grandmother because Evelina does not have enough space for all. But gradually she wants to expand her house. “As soon as I have some money left, I buy material from it and build another room,” she says optimistically. Then she wants to reunite her family. 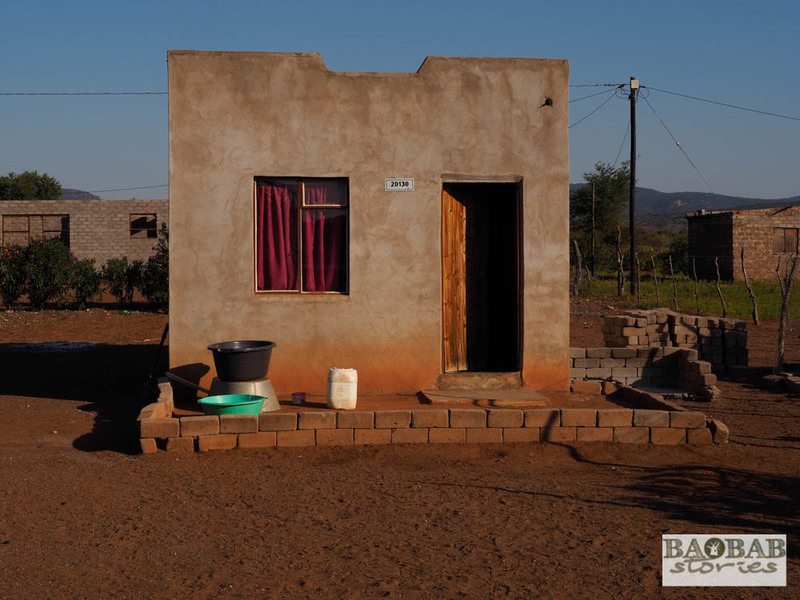 “Building houses in stages is very common here – most people do it like that,” she adds. She keeps afloat with piece jobs and the grant money she receives from the government for her underage children. She earns her regular income by selling popcorn and bread to students at the nearby school. “Money is always tight – that’s why I am happy about the extra income I get from selling baobab fruit,” says the Baobab Guardian. It helps her to slowly build a new life. Next year Evelina will lose government grant for one of her children which will reduce her regular income. 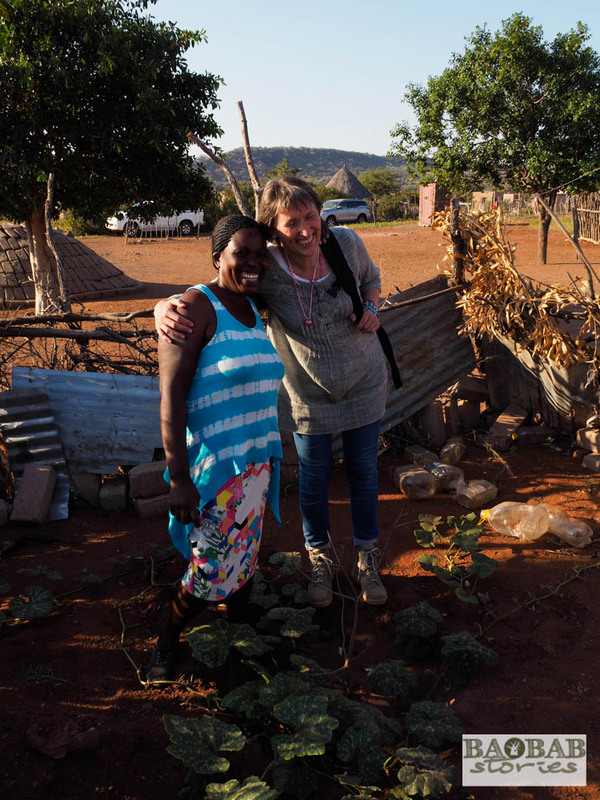 But Evelina does not let herself be discouraged: “life goes on and I’m sure new opportunities will open up for me.” She lives in a community where one supports each other. Most of the people in the village live under similar circumstances and try to make a living with piece jobs. That turn into a challenge for families around Christmas time, when the children would like to get gifts and the season for parties and family get-togethers starts. “That’s why we started a savings association,” says Evelina, adding, “Every woman pays some money every month to another woman.” The amount is noted down in a book. The recipient hides the steadily growing amount in a safe place. Payday is in December and the women involved get their money back. It seems easier for them to reach their saving target together. Apart from the money Evelina receives from selling baobab fruits and looking after the seedling, she has other uses for baobab: “I mix the fruit powder with water and some sugar and enjoy a refreshing fruit juice.” Sometimes she adds a little more powder to the water – which turns into a kind of milk-free, vegan yogurt. She burns the hard shells of the fruits and uses the ashes like baking soda in the kitchen. However, it may take decades before she can reap the first fruits from her little baobab in her home garden. Baobabs in southern Africa usually bear their first fruits at the age of about 25 years. However, in Limpopo Province, they may take up to 100 years until they produce their first fruit. 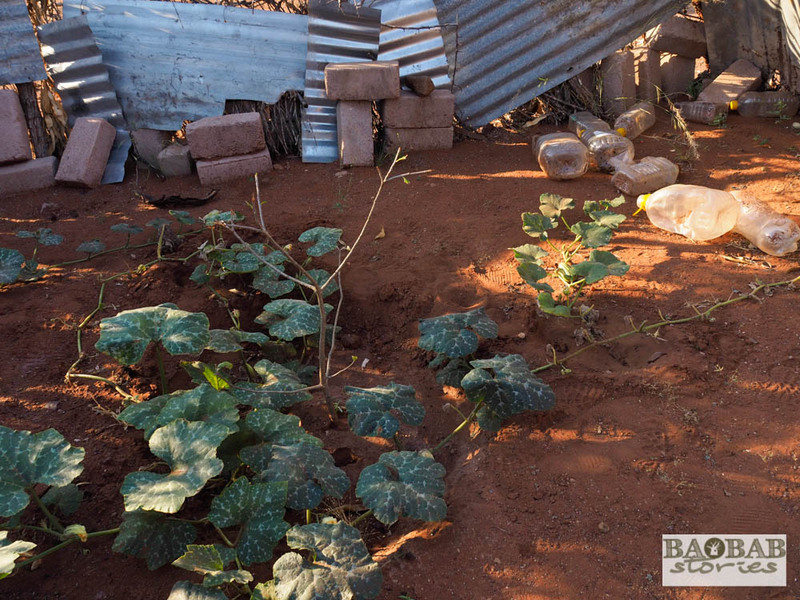 This entry was posted in BaobabFriends, Fruit_Usage, Projects, Stories, Tree_Usage and tagged Baobab, Baobab Foundation, Baobab Guardians, Dr. Sarah Venter, Evelina Tshitete, growing baobabs, Limpopo Province, South Africa by Heike Pander. Bookmark the permalink.